The first time I had a scone it was from a bakery. My impression of it was that it is dry, crumbly, not much flavor but very fulfilling. 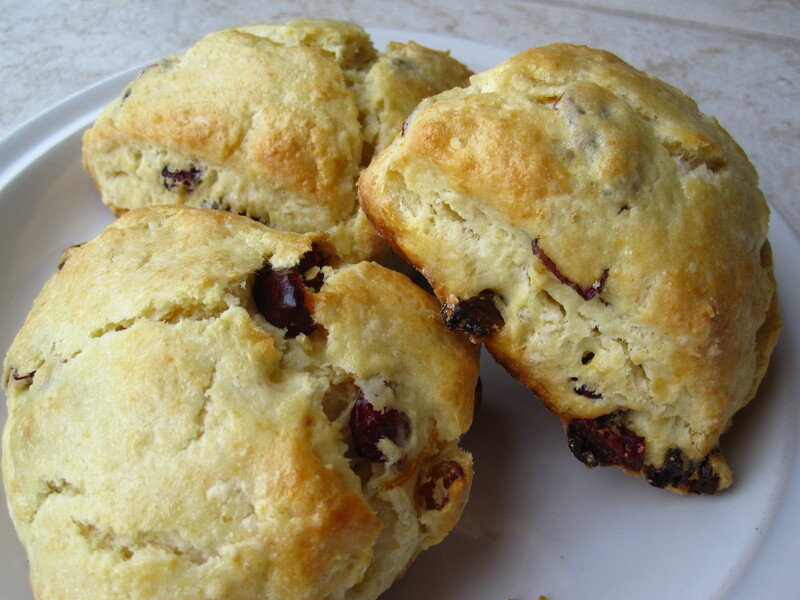 I have never really like scones ever since, until recently my neighbor gave me some scones and told me to eat it warm– then I start to appreciate the simplicity of its flavor. This recipe is from my neighbor but I made some changes on the ingredients and preparation method. In a large bowl, stir flour, sugar, salt and baking powder to combine, rub in butter until the mixture resembles of coarse crumbs. Mix in dried fruits, nuts and zest. In a small bowl, whisk eggs, cream and vanilla extract. Reserve 2 tbsp of egg mixture and pour the remaining egg mixture all at once into the flour mixture. Use a spatula gently stir until the dough comes together. Do not over mix or the scones will be tough. Transfer the dough to a lightly floured surface and knead the dough gently 4-6 times then divide the dough in half. Pat each half into 6 inch circle, and cut into 6 wedges, for a total of 12 wedges. Brush scones with reserved egg mixture and bake for 15-18 minutes, until the center is baked through and golden brown on the edge. Serve immediately with butter, jam or lemon curd.